Safety razors are the predecessor to the modern cartridge razor. They were widely popularized by King Gillette in the 1900’s after he patented his safety razor design in the early 1900s. Safety razors are quite different from today’s multi-bladed cartridge razors. Most cartridge razors today having a pivoting neck with the blades sitting at a 20-40 degree facing back towards the handle. With a safety razor the blade itself sits at a 90 degree angle to the handle. 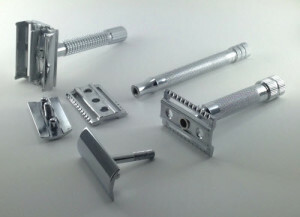 There are many different makes and models of safety razors. 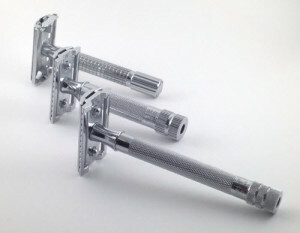 The most basic safety razor usually consist of three pieces. There is a handle, a guard, and the top of the guard. The blade of a basic safety razor will sit between the top of the guard and the guard. The top of the guard screws into a threaded hole in the handle. When you screw the top piece of the guard down into the handle this not only fixes the razor blade in place, but it also gives the razor blade a slight bend. Another type of safety razor only consists of two pieces. The handle and the blade guard are fused together. This leaves only the top piece left which screws into the handle. Usually you unscrew the top piece of these two-piece safety razors by turning the bottom of the razor. This causes the threaded mate of the top piece to turn so you can tighten and loosen the top piece as needed. More sophisticated safety razors allow you to open the top of the razor up by turning a mechanism on the handle. You then place the blade into the razor and turn the mechanism the other way to close the top of the guard. With these safety razors you are able to adjust the “aggressiveness” of the razor which refers to how much the razor blade is bowed to change the angle of the shaving edge. Safety razor blades are extremely cheap. The price per blade depends on the brand of blades you are buying and also the quantity of blades you are buying. It’s quite common to find safety razor blades for between 7 to 75 cents. More expensive safety razor blades can run between $1-$2 a blade, but these are still a bargain to some of the “umpteen-bladed” razors you find in the retail stores today that run you $4 a cartridge. People switch to safety razors for different reasons. Some people switch because they are tired of paying the exorbitant prices for cartridges. Other people switch because the multi-bladed cartridge razors irritate their skin and the single blade of a safety razor allows them to shave without irritation or razor burn. Still other people just like the feeling of a quality-crafted razor. Merkur: A company owned by Dovo. Edwin Jagger: An England based manufacturer of safety razors. Parker: An American safety razor company.